for all MovieStuff Universal motion picture gates! The MovieStuff Universal Home Movie Scanner is a great archiving tool. Simple to use and clear, precise results have made it the number one selling true frame by frame desk top scanner in the world. And now the newly developed LightPin sprocket hole sensor has made it even easier to use. The original design of the Universal required the user to "tune" the sprocket hole sensor to accommodate differences in film density, such as clear edge film found in commercial 16mm prints or film that might have clear or semi transparent imagery that appears between the sprocket holes such as on old regular 8mm film. This obviously requires a certain level of skill and also takes up precious time during a busy day of transfers. The new LightPin sensor requires no "tuning" or calibration. Why? While the original UV LED was a pass-through sensor which could be affected by film density, the LightPin uses a reflective, hyper thin LED beam (no laser!) that bounces off the film surface and back into the sensor. As a result, it does not matter whether the film is clear, dark, light or all of the above! The LightPin sensor never needs adjustment and (as far as we can tell) never misses a frame. In addition, we've simplified the film path with new guides that have new side springs for solid side to side registration. This virtually eliminates side drift, even on slightly shrunken film. 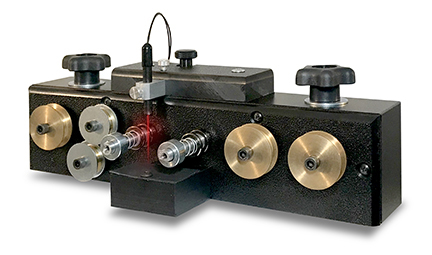 We have also created a variable tension film path that let's you control the amount of tension your particular film might need during a transfer. Plus, the film is now supported on the emulsion side, which means no focus shifts, even when you have changes in film thickness. For information about how to order, how long the modification process takes, how to pay, please click HERE. Or call us at 830-966-4664 and ask for Roger.